One of the best part of having a vegetable garden is all the wonderful homegrown produce that is right in your back yard. One part of growing a garden that people seem to forget to mention is that sometimes (Ok, well maybe more like often) you have an over abundance of veggies. Right now that is going on in my garden. I have so much yellow crookneck squash. Seriously, I love squash but i’m at a point of what the heck do I do with all of this squash? I’ve roasted it and sautéed it, I have even frozen some of it, i’ve spammed my Facebook friends for recipe ideas too. Looking at the squash I wasn’t sure what to do with it anymore then I remembered something I first made a couple years ago, zucchini cakes. 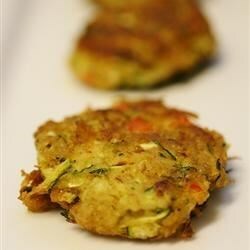 Zucchini cakes are basically a vegetarian crab cake and delicious! I figure why not try it with the yellow crook neck squash, I had nothing to lose. I have definitely earned back my dollar and change I invested when I bought the seeds back in the spring. I threw some gluten free bread in the oven to toast up and dry out to make some fresh breadcrumbs and went to work on shredding my squash, making sure to remove the seedy portions. The seeds just don’t shred that well. After draining the squash I put together the faux cakes and started frying and let me tell you the squash cakes were delicious and were a hit with my family! They were the perfect way to use up some of my excess squash. I know I will be making them again real soon! Do you have squash (yellow or zucchini) growing like crazy in your garden? Try this recipe and discover a new delicious way to eat squash! Heat olive oil in a skillet over medium-high heat. Fry patties until golden brown, about 4 minutes per side. Drain on paper towels.